Explore the towns of Arzachena, Cannigione & Porto Cervo and see a different side to the north east part of Sardinia. Arzachena, the local market town offers several hidden treasures including mysterious nuraghe (stone towers) ruins and giant tombs, arguably the best of their kind in Sardinia. Or you can explore the coves and beaches to the north, starting with the resorts of Cannigione, good for water sports and continuing past Palau to the long inlets of the north coast or rural Arzachena. All are within easy reach. Set in the heart of the resort and lined with cafés, bars and restaurants, the "Piazetta" is the perfect spot to lounge in style - it is the place to see and be seen. An evening stroll along the quay is also a must, with designer boutiques on one side, and luxury yachts lining the marina on the other. The posh boutiques selling fashionable designer goods such as Gucci, Versace, Prada & Hogan continue the trail throughout the pastel coloured maze of grotto-like shopping arcades within the resort. Italian architect Michele Busiri Vici designed this grotto-like creation and has a strong presence within Porto Cervo, having also designed the Stella Maris church. Elevated and situated in a craggy edge of the land, to the west of the centre, the church is something of an art deco landmark that overlooks the comings and goings of the town. In the summer, there is a series of top sporting events held in Porto Cervo, including regattas and golf tournaments. Top quality tennis facilities are used for tournaments in the summer and open to the public at other times. 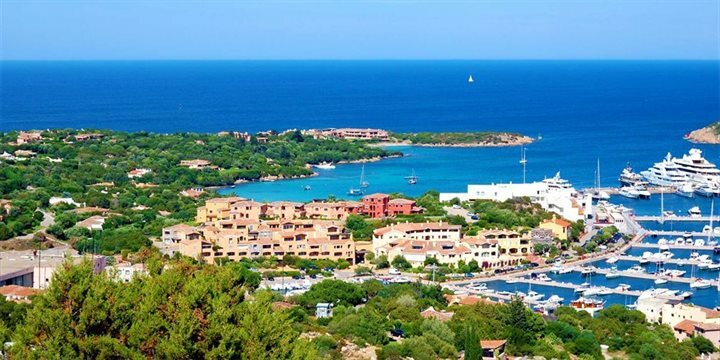 Find out more about Porto Cervo via our informative blog.